Nam Tran is an award-winning practitioner who gives lectures and demos at universities and exhibits internationally. A ceramic lecturer and head of the departments in design and multi media with Kensington and Chelsea college. 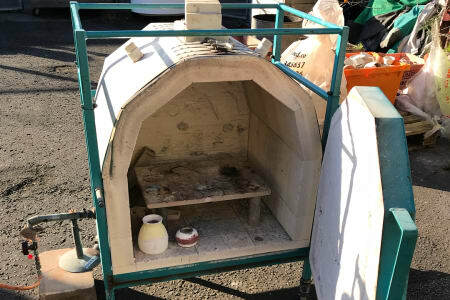 Nam specialising in wheel thrown raku, bringing years of experience and craftsmanship to every object made. Tran's work focused primarily on exploring the physical properties of clay and material experimentation is a strong characteristics of his work. He has been developing making enclosed forms that are much stronger than open forms and therefore resonates well with the alternative firing technique he uses. His work is dominated by thrown pieces that subtly echo the urban roots and conceptual design. Nam Tran first made pots as a teenager on a wheel in his own bedroom and remembers being captivated by the experience. With his unique alternatives methods and approach to ceramics Nam Tran identifies rules and manipulates and bends them. Really enjoyed this workshop, Nam is a great teacher and did his best to offer advice and help us make a really beautiful pot to take home. Would definitely recommend. Great class, worth every penny. Birthday girl loved the experience. Lots of fun! The birthday girl was very pleased... Feel like a real artist with my imperfect-perfect vase :) I really liked it and I will be coming back. Really fun workshop! We thoroughly enjoyed it. Suitable for beginners. Looking forward to another Obby class soon. The taster class was great! The teacher helps you centre the clay and from that point its not too difficult to make a first pot design, which you can pick up once its dried, so even a first timer can have a souvenir from the class! Would definitely recommend! Really enjoyed the taster workshop! Great for people who have never done anything similar as everything is explained well and you also get individual help if you need it. You also get to keep the amazing things you create as evidence of your great skills :-) There are 2 parts to the workshop where you learn 2 different techniques to pottery. Only thing I would say is that it'd be nice if you had an idea of how much time is spent on each as it felt a bit rushed towards the end of both. But that's a minor point as other than that everyone and everything was really great there! It was my first pottery class and I had a great time and managed to make three wonderful pots! I will definitely recommend this class. Loved it! Staff were very helpful and I will def be coming back! Brilliant fun! The instructors were informative yet relaxed and I felt like I learned a lot in just two hours (which flew by!). Throwing on a pottery wheel is much harder than it looks and is a bit of a work out for the core and arms - added bonus ;-) Recommended. Absolutely amazing workshop! Nam and Suzie were so experienced, supportive, and made the class so much fun..I was laughing and smiling for the whole 2 hours! The class size was small (only 5 of us) which meant that it was extremely hands on. Even came away with a some free pots! The class was great fun, relaxed, creative and I was able to make 3 pots using two methods or creating the pot. There was flexibility in what you made and the teacher was professional, helpful and relaxed. 2 hours didn't feel like enough purely out of a new found enjoyment for pottery! Really enjoyed my first session and can't wait to come back for some more lessons! Really great class! The teacher's were really supportive and helpful. I would definitely recommend this class to anyone wanting to give pottery a go! Thoroughly enjoyable! Can't wait until the next course. The teacher in this class was awesome. Really nice space and I enjoyed the hell out of throwing. It was a good mix between practising & exploring ourselves, and teaching & support ... Very creative & knowledgable teacher, so I enjoyed it & recommend it for anyone interested! I chose this as an experiential birhtday gift for a friend. We went together and had an absolute blast whilst learning something completely new. Who knew throwing could be SO therapeutic! Couldn't recommend enough. We both absolutely loved this workshop and for two hours we got a lot fitted in! Our teacher was great, really knowledgeable and had a good sense of humour! Thanks so much! For complete beginner this is excellent class. This class was very relaxed and getting working with clay was satisfing. Teachers are very friendly and dedicated to they job. Think of what you wear don’t want to get your shoes dirty :). Exactly what I was after - helpful and friendly instructions in a really relaxed atmosphere. Good fun, I'd definitely recommend it. I liked Nam's insights into the potter /ceramic artist life and would like to continue with another workshop. The atmosphere was relaxed and the teacher lets you find your own style, but teaches you the basic techniques well. There's also a lot of inspiration to find in the workshop room itself as there are hundreds of pots/sculptures around. If you can catch a class, do it. What a fantastic workshop! Two friends and I went to the Elephant & Castle workshop and spent a few hours with Nam Tran. He was a great teacher and we had a very enjoyable day. He made the session fun while also talking us through a little of the history of Raku firing. Would definitely recommend booking this. This was my first time experiencing Raku Pottery - I thoroughly enjoyed the workshop and am pleased with the outcome of the pots. It was interesting hearing about the history of Raku; Nam is brilliant in sharing his knowledge about ceramics and a great host. I will definitely be signing up for more pottery workshops at Art in the Park. Great! 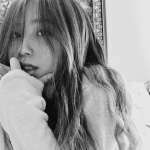 Nam is extremly nice as a teacher and as person. Enjoyed thoroughly the entire session of throwing a small pot in terracotta and making a pot using coiling technique. Really good fun, got to try both hand building and the wheel. Definitely recommend it! I really enjoyed the taster course. Two hours of pottery. throwing on wheel was my favourite. Might need to go back to learn more. Fantastic class! So much fun and the instructor was amazing. Would highly recommend. We had a wonderful time at this class with Nam! He is an amazing ceramicist and a great teacher. He made everything easy, even for the untalented ones like me! Would love to go back. The workshop was great! I learnt a lot in just 2 hours and really enjoyed the friendly and welcoming atmosphere. This was a wonderful workshop! It was everything I expected. The small class size means that each person gets individual attention. 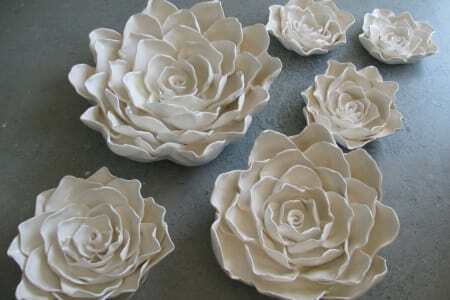 I liked the format of the class, the interesting facts given about ceramics and the overall calming atmosphere. Would definitely do it again! The class was in a very relaxed environment. The tutor had great expertise in this field and supported everyone with great hospitality and respect. Effective communication throughout and a fantastic field to get into! Absolutely loved the class! It's really well taught, with excellent materials and equipment. I would've loved to spend more time of the wheel, rather than the handmade pottery, but still really enjoyable. Will definitely be back for another class! Had a great time at the 2 hour session, highly recommended! It was a really fun workshop. Nam was a patient and knowledgable instructor. Had a great time playing with clay and even made something out of it! Great course and very cool teachers who are themselves great artists. Learned a lot whilst having fun. Would definitely recommend! Great taster session, Nam was welcoming and informative. I'd recommend it if you want to get out of the house and just see if pottery is your thing. You practice hand building and the wheel within the 2 hour session. Nam was a brilliant teacher. Good value for money as well. Great class! Always wanted to try it and Nam is so creative he made the class so enjoyable. Definitely worth going to! Super fun with enthusiastic and encouraging instructors! I had a lovely time. It relaxing and casual, just what I needed. I had a chance to build something by hand and on the wheel. It is a taster session so time does go quick, but it was enough for me to be interested in a full course. Really enjoyed this class - would definitely recommend. This was a lovely taster workshop. Enjoyed both the coiling and throwing parts. Very relaxed and friendly. Quite fun to learn the basic skills and very enthusiastic tutors. It would be good to have a bit more time though. Very insightful as my first ever attempt at pottery. Great teacher and managed to finish a few pieces that I can take home. Really fun class - I think I have the throwing bug! This was such a fun and different day out. The class was well organised and the instructors were extremely helpful and knowledgeable of their craft, but still made it fun and enjoyable! I would high recommend this class! Really enjoyed the class. The tutors were really friendly and helpful and provided a great intro to pottery and ceramics. Looking forward to picking up the pieces we made and will definitely go back. Thanks! Really loved this session! I was a complete beginner and felt like I was able to walk away after 2 hours having already learnt basic ceramic skills. Keen to go back again, the group was a perfect size which meant the tutors were on hand to provide focussed attention on each individual’s performance to help you properly master your skill. Easy to book through Obby. Great short workshop perfect for a weekend getaway to learn a new skill. Nam and the team where great tutors, and very tentative even when in a medium to large sized group. The class was fun, enjoyable and a perfect intro to coiling and throwing on a wheel. The pottery itself was relaxing but also the added bonus of being able to collect your work for a small fee after its been glazed and fired. Highly recommend! Excellent experience really enjoyed it, very good atmosphere , people super nice, I wish it could have last longer! If you’ve been umming and aring about going to try this out, just book it! It’s a fun couple of hours and it goes so quickly! Nam makes the instructions clear and helps you as much as you need and although I’m defiantly no good at coiling (or I need more practice) it was fun to try an alternative to throwing! Recommend this to anyone! Great taster class, would definitely recommend for a first timer. Nam explained and taught us two techniques 1)Coil 2)Throwing. Class was super informative and Nam was a great teacher. Lots of fun and definitely worth it. Had a fun afternoon. Nam the tutor, was very informative, enthusiastic and passionate about the art of pottery. Great workshop; good balance between hand building and throwing. Very much enjoyed it for a Sunday afternoon. Could have had another hour of throwing. It was a really fun and informative session! This workshop was great. I had a very nice time. Nam was friendly and explained us well. I strongly recommend if you want to try something different and are interested in pottery! This was such a fun class. Got to learn about two types of pottery making, the coil pottery and the wheel pottery. The the teacher gave us a lot of information about the the clay types and techniques and I learnt so much in 2 hours. Great course, very reasonable price and good fun for someone who wants to try something new! Great! We really enjoyed it! 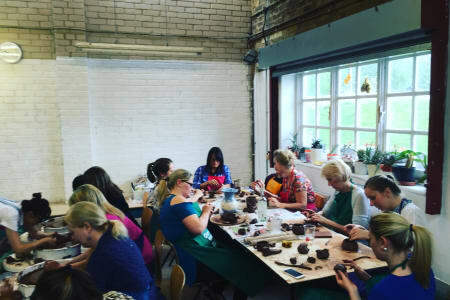 This is the perfect workshop for anyone who wants to get a taste of pottery. Nam was excellent and the class allows the participants to experience different types of pottery as well as keep the goodies! Materials were generously available and Nam is great at giving everyone personal time as well as working with the whole group. Highly recommend!!! Fun class but wished it was longer! This workshop was great and I'd definitely recommend it! Nam and Suzie are both friendly, great teachers and ensured we all had something to take home, as well as making the class really fun. Such a great class, had a really really fun and enjoyable time. Wonderful teacher, I highly recommend!! Great 2 hour taster session with Nam and his enthusiastic team on Sunday afternoon. Large easy to reach studio - clay throwing was the highlight! Looking forward to seeing my creations soon! I know nothing about Potter, but the instructors made the class very enjoyable and easy to learn. Really had a lot of fun! Would definitely recommend it to newbies or even those who have done it before. Fantastic taster pottery class! It was fun to try to make a bowl and make some ceramics on the wheel. A nice class that is good for beginners. So much fun, had an amazing time. Definitely recommend this class. Really nice experience. If you never tried pottery class, this is the right way to understand if you really like it. A general imprinting about pottery can let you decide to sign up for a class. Otherwise you can spend relaxing hours followed by two good and kind teachers. Thank you guys hope to see you soon again. I loved this pottery class. Nam is a great teacher but also let’s you do your own thing and there’s no pressure creating anything you don’t want. I’m really pleased with the pots I made and was happy that we could get them glazed and take home! Will definitely be back for more. A really good class, with excellent demonstrations. However, the class was very full, and I thought we would have more time on the wheel. So much fun - and it was great to be taught by Nam! Very informative and fun class jam packed with technique. Great introduction to the wheel and other clay techniques, makes you want to go back for more. Thanks! Really helpful teacher. Great workshop - awesome value for money! The class was much larger than anticipated (about 15+ people) so individual attention was less than I'd hoped. It was nice to have half the class split between hand building and throwing on the wheel, so that we could try both, and the instructor was very friendly. However, the class description made it seem like (at least one of) our works would be included in the price - but each piece that we made and wanted fired and glazed was an additional £2 on top of the workshop price. Small class so we all got a little individual attention. There was a lot packed into the two hours. Very relaxed, very professional. Really inspired me to continue pottery. Highlight was being taught by Nam Tran himself. Such a cool guy. Planning to book a weekend of pottery in October. Would definitely recommend. Attended this workshop with my partner. Session went as we were expecting, very relaxing and informative. Both instructors were great at guiding us in the creation process. Perfect taster. Nam got us straight into making, with right balance of pace, great narrative, inspiration & exploration. Just Do it! This was one of the most fun class I took in a very long time! I had always wanted to learn the technical skills needed to create clay pots and the instructor did a fabulous job guiding us learn the skill! Definitely coming back here for more sessions! It was the perfect balance of learning new techniques quickly and being able to 'freestyle' it - the teachers were great and gave us a lot to play with! I will 100% go back and do this again - so much fun. The teachers were great, helpful, chatty and very personable! The class itself was very interesting and you are taught two different styles of pottery making, and you’re encouraged to make whatever you would like to. A great class! It was a wonderful experience! The workshop was amazing! Ideal to try something new and explore your creative side! I loved it! It was a lot of fun. Surprised my boyfriend for his birthday and we both enjoyed the workshop. Time really flies in there and the two hours went by in the blink in the eye. We had a great time at the pottery taster workshop, and felt it was value for the experience. The instructors were lovely! 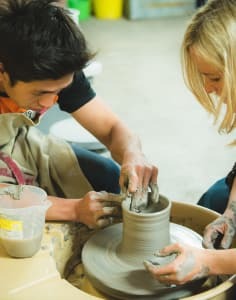 My friend and I had a good time :) I'd recommend to anyone willing to try pottery for the first time. Great class with lots of fun and the instructor was very passionate about what he does. Definitely recommended if you want to relax and try out new things. Really fun. Good chance to experience taster for pottery - tougher than it looks. Highly recommended. Great informative class with a chance to learn two different techniques. The main instructor is very knowledgable and helped us through each step whilst also letting us be creative. I had so much fun! It was very therapeutic, and the mentors were very helpful, engaging and they are really concise and clear in their teaching styles. Definitely a thumbs up! The teachers were very helpful, just wish we could've stayed on the wheel for a bit longer as 1 hour didn't feel quite enough (looking forward to taking more classes though). I loved it! Nam was a great teacher, the class was relaxing, and I was very happy with the pottery I made. Definitely recommend doing this class. Took my sister for her birthday and she absolutely loved the class! The instructors were really friendly and informative, as well as ensuring we all left with something to be proud of! However I think better directions to building F would have been handy as we reached the class 20 minutes late after aimlessly wondering around looking for the hidden building. 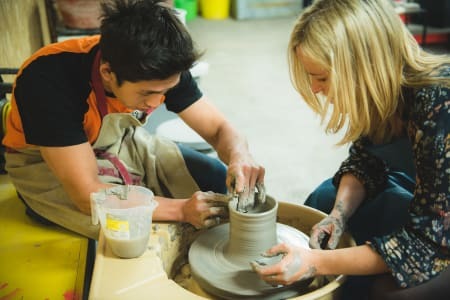 Can’t wait to book another class just for the pottery wheel! Good fun and a good level of teaching into basic pottery, both by hand and on the wheel. Excellent workshop - the instructor was engaging and very helpful. If highly recommend to anyone. My friends and I had a really great time and the teacher was amazing and really inspiring!! Really great taster session. learned a lot and you get to do a lot in the 2 hours. Nam’s pottery workshop is a great introduction to working on the wheel, and using the coiling technique. He is a great teacher, with a hands on but relaxed approach, which is needed when getting started on the wheel. He was happy to let us be creative and make whatever we wanted. We’ll definitely be back for a drop in class now that we know the basics. Highly recommend. A really lovely introduction to pottery with the chance to make three items of ones imagination (and importantly ability). I would love to have heard more about the rationale for doing things, especially on the wheel, but the team really whetted my appetite to learn more and great to be able to trial whether I would like to pursue pottery further. Had a lot of fun with this class! A good mix of hand building and wheel throwing. Plan to go back to the studio when I can. A brilliant workshop! The teachers were patient, helpful, and it was really fun. Thank you! Nam is an excellent teacher and the taster workshop is such a great way to be introduced to pottery. I can't wait for my next one! Fantastic atmosphere and great friendly teachers. Felt it is worth much more than I paid. We really enjoyed the pottery workshop and the teaching was very good. We were taught how to use the wheel and the manual method to make various ornaments. All the staff were very friendly and they welcomed anyone at any skill level! It was a really fun Sunday. Nam and the team are brilliant and really get to show you the different elements of pottery. I will be taking up a further workshop with them soon! Really enjoyed it. Relaxing atmosphere. Teacher was good, explained and showed us how the pottery is been done. Definitely would do more and would recommend it to anyone. Lovely and relaxing - a very thorough and enjoyable class. Would recommend to anyone wanting to give pottery a go! The tuition was fantastic! Nam (the teacher) was brilliant and made it easy to understand and good fun. He tried to make it relaxing rather than stressful. Being a novice, I was a bit worried! I wish we had had more time on the wheel and less time doing the coil clay, but I understand that is part of pottery making! The time just flew by much too quickly. My daughter and I thoroughly enjoyed it. Fantastic!!!!! Nam and Susy were fabulous. Excellent knowledge, fantastic resources, and very good managing skills. A WONDERFUL Experience. Great class, brilliant teacher. I learnt loads and was a great way to spend an evening. Would definitely recommend for anyone. It was a fun experience! We had great fun and everyone enjoyed it! But I wish we had more time on the wheel part to practice. Very enjoyable taster session. After an intro you get hands on making a coil pot, then another couple more on the wheel. Decided to take home all the creations, which you get fired and in a choice of colours. Support from several tutors although only a small group, plenty of space for imagination and creativity but ideas available in case you feel stuck! The decision to give this class a try was one of the best I've made this year. Nam and Susie are easy to follow, encouraging and very skilled. We really ejoyed the course and left with some beautiful cups and other creations. I would definitely recommend the class to someone who wants to keep their creativity alive and need something different to stimulate them. Really great class - experienced teacher, small class, ended up making 6 items and loved it! Will be back definitely. Nam's class was very easy to follow and he is generous with the materials he makes available to us. Nam also gives us a lot of space and time to get on with our own creations and will always be there when we need help. Would definitely recommend this class! Best workshop I've ever signed up to! Every session was amazing, great fun and learnt loads. Nam is a brilliant tutor and I love what I've manage to make across the week! Recommend to all! Had a great time at Nam’s class, got to grips with throwing on the wheel and fingers crossed will have some nice pots to take home when they’re done in the kiln! Absolutley loved this 4 week beginner course, felt like I learnt a lot in a relatively short space of time. Nam is a brilliant teacher. Would highly recommend! Nam is fantastic, his relaxed and a realitist. If you need to improve he will let you know, he also used music and humour to make the the classes very enjoyable. His really flexible and helpful. I had so much fun on the taster, I booked in for a 4 week beginners session. Had a lot of fun in these classes! Had a good mix of hand building and wheel throwing. Plan to go back to the studio when I can for intermediate level.